We cordially invite you to the Media Walkthrough for the public art project, GaiaMotherTree by the Brazilian artist Ernesto Neto on Friday, June 29, 2018 at 10.00 am in the Wanner Hall of Zurich Main Station. From June 30 to the end of July 2018, the Fondation Beyeler will be showing a project by the Brazilian artist Ernesto Neto (b. 1964 in Rio de Janeiro) in Zurich Main Station. The monumental work GaiaMotherTree, a sculpture made of brightly coloured hand-knotted cotton strips, resembles a tall tree, extending right up to the ceiling of the station concourse, which is twenty meters high. GaiaMotherTree is a walk-in structure that functions as a meeting place and a venue for interaction and meditation. A varied program of events for adults and children, with music, meditations, workshops, talks and guided introductions to the work, will take place inside the installation. 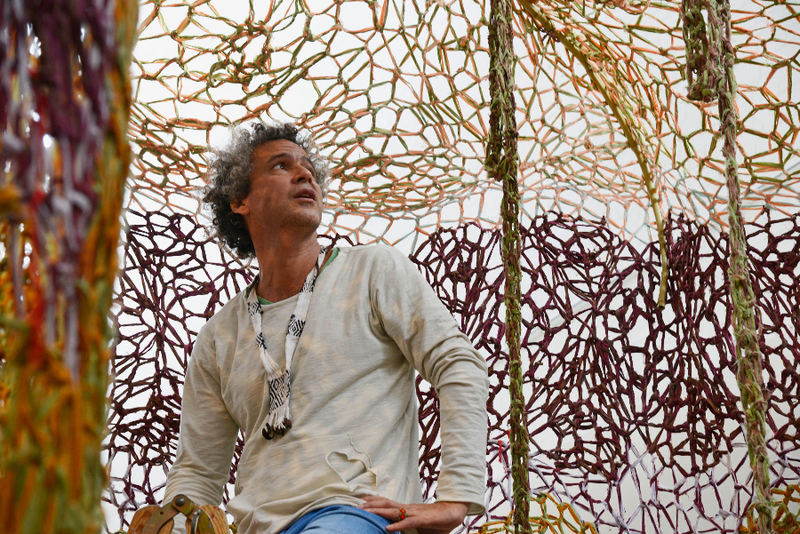 Ernesto Neto is one of Latin America’s most important contemporary artists. His work has won worldwide recognition, with several presentations at the Venice Biennale and exhibitions in the world’s leading museums. In recent years, Neto has been working in cooperation with the Huni Kuin, an indigenous community living in the Amazon region near the Brazilian border with Peru. knowledge and craft skills, their aesthetic sense, their values, their world view, and their spiritual connection with nature, have transformed Neto’s conception of art and become integral elements of his artistic practice. Representatives of the Huni Kuin will be present at the media walk-through. PLEASE NOTE that advance notice is required for interviews. Please inform us of your interview requests as soon as possible!